The gazebo at Miller Point was built by the CCC during the Great Depression. 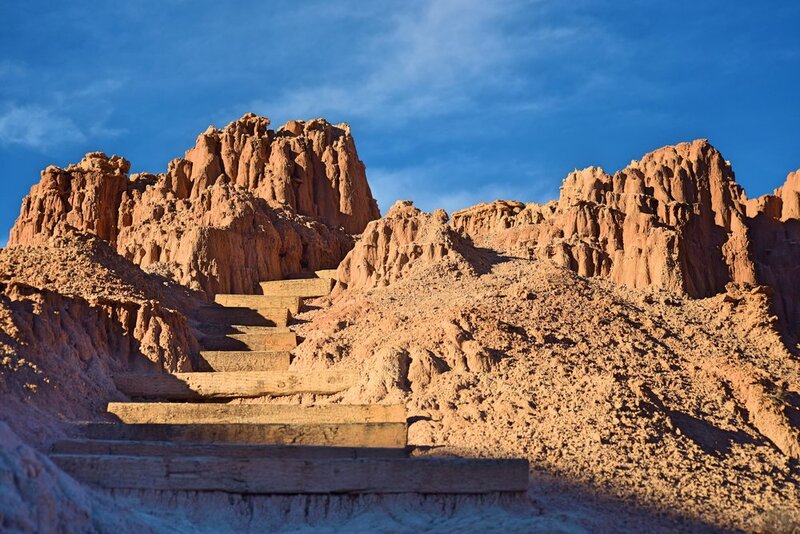 Stairs lead down Miller Point and into Cathedral Gorge. We love to explore places that feel a little bit out of the way. Since we are traveling in our van for a year, we don’t feel limited to just visiting the major national parks or more famous destinations. We’ve had great luck discovering smaller places that are a bit out of the spotlight. One recent destination like this was Cathedral Gorge State Park. 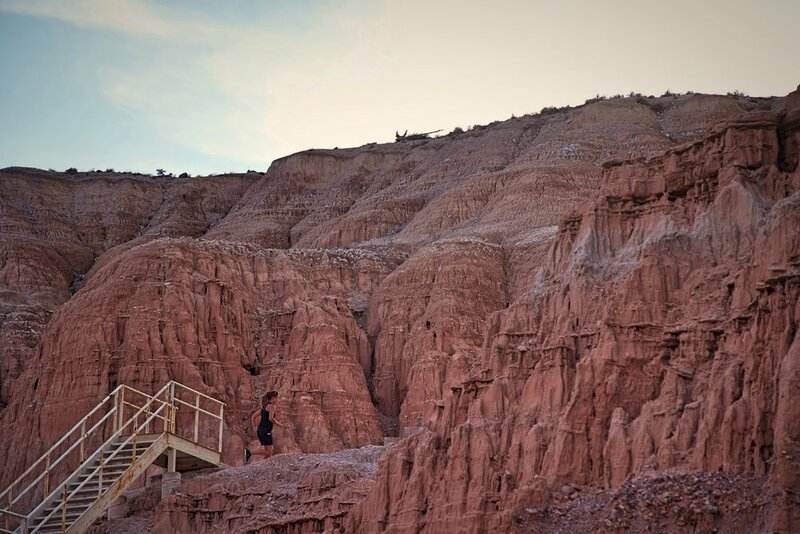 Cathedral Gorge State Park is about three hours from Las Vegas, near the towns of Pioche and Panaca. Since it’s farther away from Vegas than Valley of Fire or Red Rock Canyon, there were many fewer visitors. When we visited in October we had the luxury of being on our own most of the day. It’s smaller than many of the other parks we’ve visited in Nevada with just about 1600 acres to explore. What’s great about that is that you can actually see most of this park in a day! 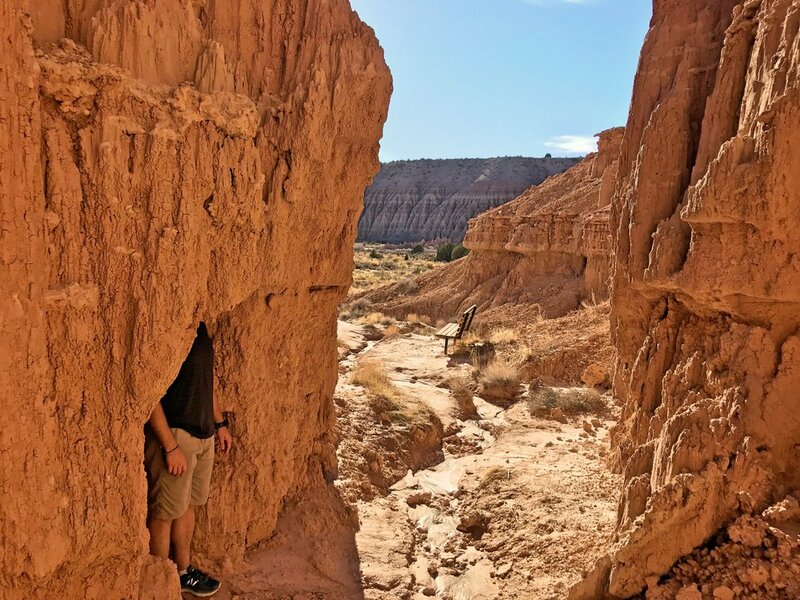 The main features of the park are extremely narrow slot canyons of eroded bentonite clay known as the “caves.” Besides the caves, there are about nine miles of trails, and a campground. We started our day at Miller Point where you can access the 1.6-mile out and back Eagle Point Trail. From here you can also access Miller Point Trail, which connects to the rest of the park’s trails. The Eagle Point Trail overlooks Cathedral Gorge, which is the eroded remnants of an ancient lakebed. 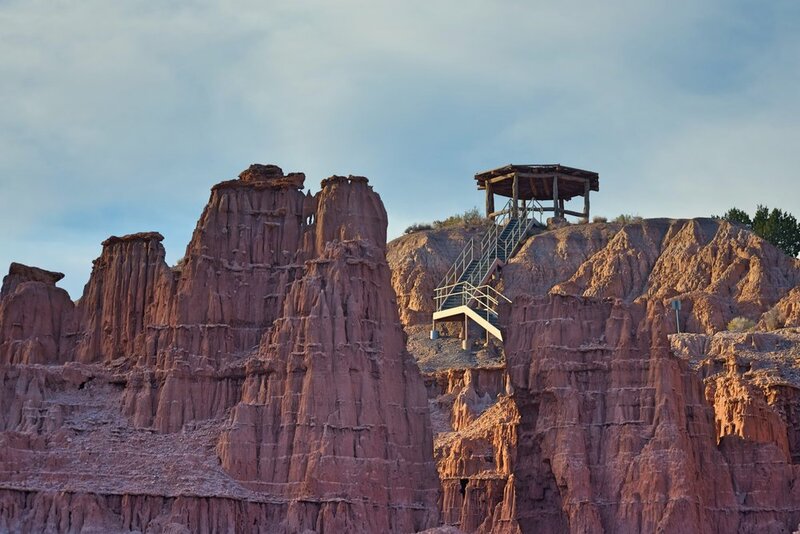 You get a bird’s-eye view of badlands, spires, and canyons on the floor of the gorge. There are also interpretive signs that tell you the names of the plants along the walk. Eagle Point definitely wasn’t our favorite trail. If you’re short on time, skip this. You stay above the valley and you can’t get down and explore the geology. 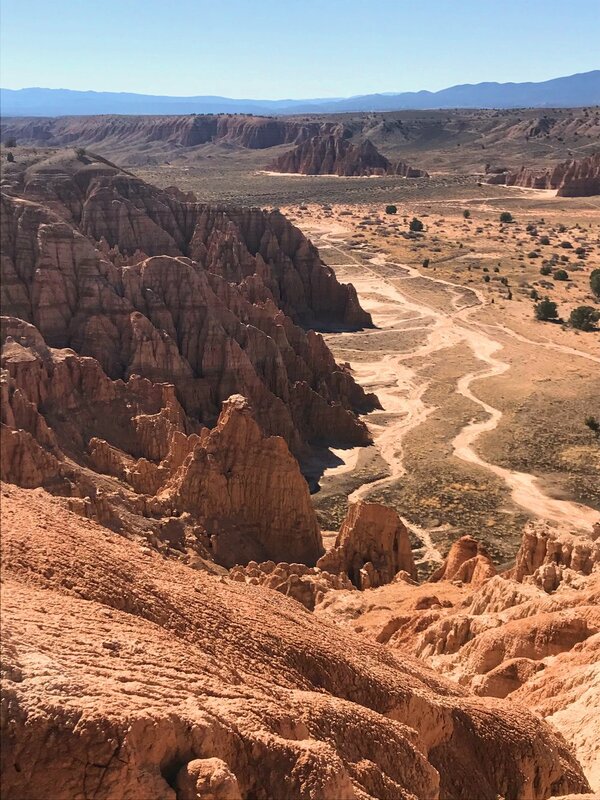 From the Eagle Point Trail, you get a bird’s eye view of Cathedral Gorge. The soft bentonite clay of Cathedral Gorge’s unique formations was once an ancient lakebed. Kaylee running on the Miller Point trail. I was so thirsty that I ran back to the van at the end of the day to get water. Wooden stairs built into the clay of Miller Point. Near the bottom of the stairs, Ian discovered a massive cave (in this case, it’s actually a true cave with a roof, not a narrow slot canyon). It’s definitely worth exploring around the Miller Point area, but if you do, make sure to stay on washes and avoid stepping on any of the delicate cryptobacterial crust. Looking into one branch of Cathedral Gorge about halfway down Miller Point. Ian walking on the Miller Point Trail. It’s only when you get up close to the walls of the canyon that you can spot the narrow entrances to the caves. In fact another group of visitors almost walked right past the caves, until they saw us disappear into them. One of the first things we noticed was how instantaneously cool it was inside the caves. Although the caves start with narrow entrances many of them open into large room-like spaces that branch off in various directions. There are countless winding routes to explore. As you get deeper into each mud slot, the canyons get narrower, and the walls get straighter and taller. In many places we had to squeeze through sections sideways. Each cave ends abruptly with a smooth rounded chamber that is like the headwall of a waterfall. The “caves” are unbelievably deep. It might be bright and hot outside, but the caves are still really cool and dark. Ian walking around outside the Cathedral Caves. The Canyon Caves were probably our favorite set of caves. The Canyon caves are even deeper and more twisting. There are so many of them and they were so deep that we had to explore them systematically by always going left and entering them one by one so that we could see them all. Toward the end of some the Canyon Caves, they even have thin roofs of clay over the last bit of canyon. The caves are dark, but when you look up or back towards the entrance where the light is coming in, the mud walls reflect a beautiful golden orange color. The sky is just a sliver of blue above you. There are many places that are about half as wide as this. The light inside the caves is a golden orange color. Some of the Canyon Caves actually had roofs in places. The final caves we explored were the Moon Caves. The Moon Caves are shallower, and they seem to be a little lighter in color. Some of them are still pretty deep and we definitely still felt like we were the first people to discover some of the nooks and crannies even though that’s almost certainly not true. At one point we somehow got kind of on top of some of the ridges over the top of the caves. It was neat to see some of the slots from above, but it also felt like at any moment we could break through a crust of clay into a cavern below, so we would not recommend that. I had to convince him not to shimmy all the way up like that! The view as you exit one of the Moon Caves. Looking down from above into a cavern that we discovered. Once we had explored every branch of the caves that we could find, we headed out on the longest trail in the park the Juniper Draw Trail. At four miles, you get to see more of the valley floor as well as the carved walls and pillars of the canyon. You start off the hike by circumnavigating a really cool spire that stands alone, separated by the walls of the gorge by years of water erosion. Some of the formations in the center of the valley that have detached from the walls through erosion. Ian walking on Juniper Draw trail. There is no shade at all on the trail. The trail follows a dry wash for most of the way. It’s very flat, but it’s kind of a difficult texture to walk on, and there is no shade. Walking this trail in the heat of summer would be pretty rough. We thought we’d be hiking about four or five miles, but at the end of the day we had hiked nearly nine because of all the cave exploration! Ian was pretty serious about exploring every nook and cranny. The walls of the gorge are full of interesting layers and formations. 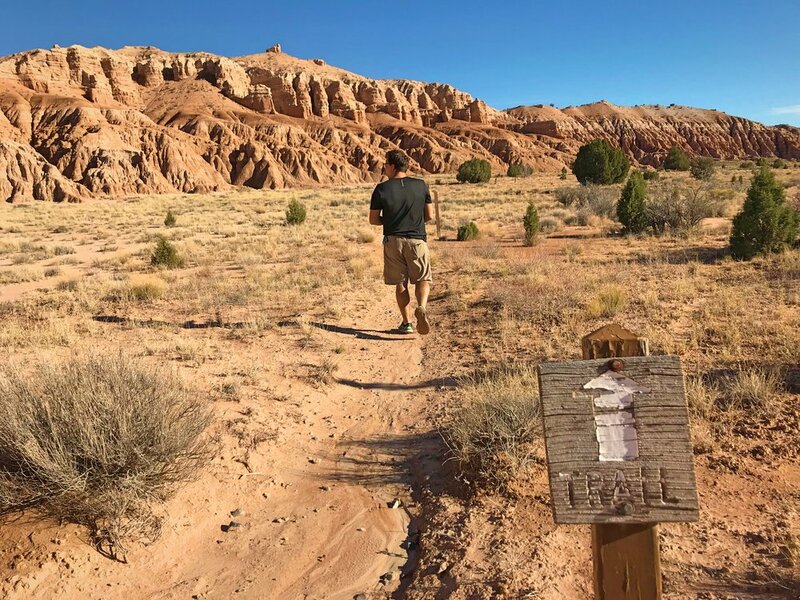 Free camping nearby: We spent two nights camping on some BLM land north of Pioche, NV while visiting Cathedral Gorge State Park. Since this land is at a bit higher elevation, unlike other desert sites in the region, there are Juniper trees that provide a small amount of shade and more privacy. Not that you’ll need it, I went for a 4 mile run along the road, and I didn’t see another person or even the signs of other people. Our last look back over the gorge while returning to the van at the end of the day.